Apparently the bunnies were having a party on one side of the sundae. I proceed to enjoy the first half of this sundae. Sometimes I don't really want to stop, but there are just so many brownie chunks (and overall chocolate factors) that it's actually pretty easy to only eat half of this 500 calorie treat. That may sound like an insult but I don't think it is in this case. 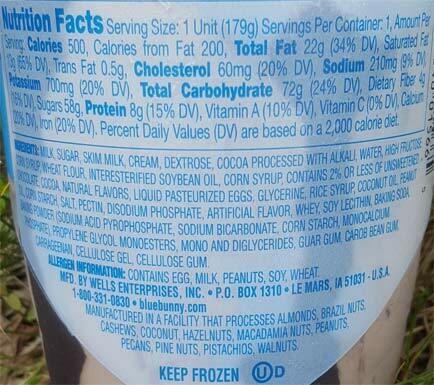 Maybe if the peanut butter one had been more consistently on message, then maybe it would have been easier to only eat half of that one too. 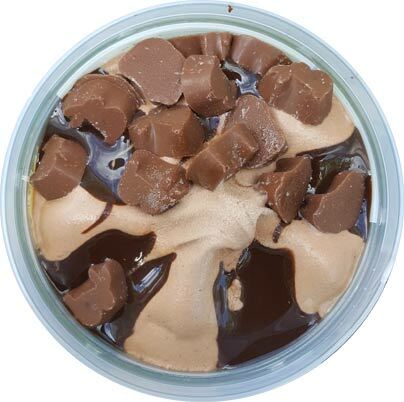 So, soft chocolate ice cream, fudge sauce, softer brownies and harder bunnies come together for a big chocolate blast. It doesn't taste like super high end chocolate ofcourse, this is meant to be a mainstream product, but I'm pretty sure it could give you the chocolate fix you desire. I want to make one more comment but it's more of a thought than a nitpick. 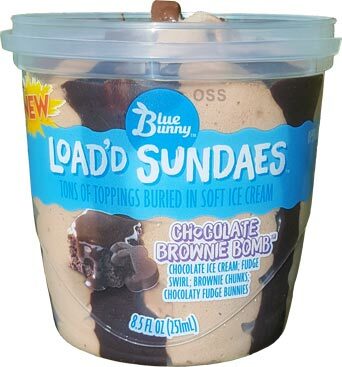 So there were the bunnies on top and then the base ice cream was fairly gooey/gummy from the brownies. I don't know if I wanted some in between factor like maybe some tiny chocolate chips. Does that make sense? I've got both ends of the texture spectrum but I want one more crunchy (but not large) factor to tie it all together. Overall a respectable chocolate break and I look forward to eating the other half in a bit. 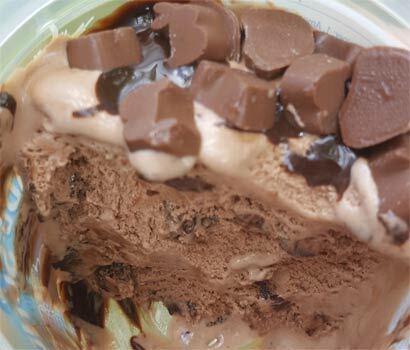 On Second Scoop: There was so much chocolate flavoring (sauce) yesterday that I managed to save the second half for today. I think the best way to sum this one up is that I would be surprised if I didn't buy it again. It's just such a bold chocolate fix that at some point I know I will crave it again. Yes, it leans heavily on the sauce for the chocolate blast, but factor in the brownie bits that are in every bite and you get a pretty fun treat. This might be the funnest of the three I have tried so far. I’ve only had the cookies and cream one and that was pretty good. It had the big cookie pieces that provided the “crunch” in the middle of the ice cream you mention you wish you had! It’s also, I think, the lowest calorie (though admittedly not by far). I enjoyed it but don’t like the $3 price tag. Now that is something I want to sink my spoon into. I checked out the Blue Bunny site and see they have a strawberry shortcake and mint chocolate chip flavor as well, so I am going to have to hunt these down.